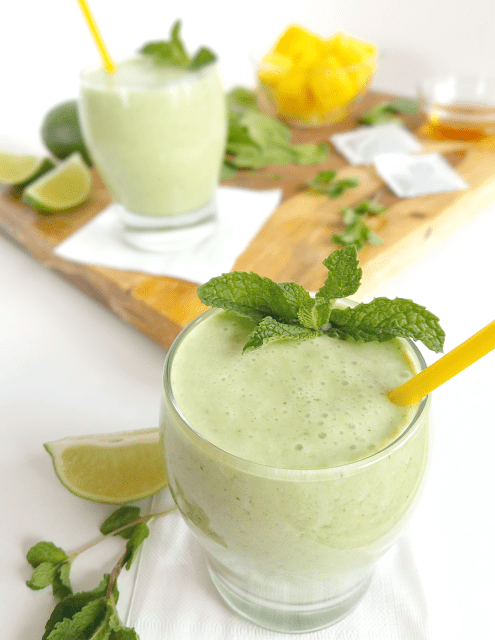 This Matcha Green Tea Smoothie with Pineapple and Spinach is refreshing and delicious, but it’s also super nutritious, dairy-free, nut-free, Paleo and easily made vegan! Spring has sprung early around here and massive allergy problems along with it. My allergies have been worse this year than ever in my life, and I’ve never really had an allergy problem. I’ve heard lots of people say the same thing, so I’m here to help with a smoothie that has ingredients that help with allergies! 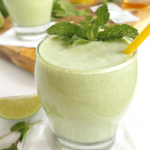 But not only will this Green Tea Smoothie put on its gloves to fight your allergy symptoms, it will also provide tons of great nutrients, antioxidants, and fiber, all in a refreshing and delicious smoothie that’s friendly to special diets. 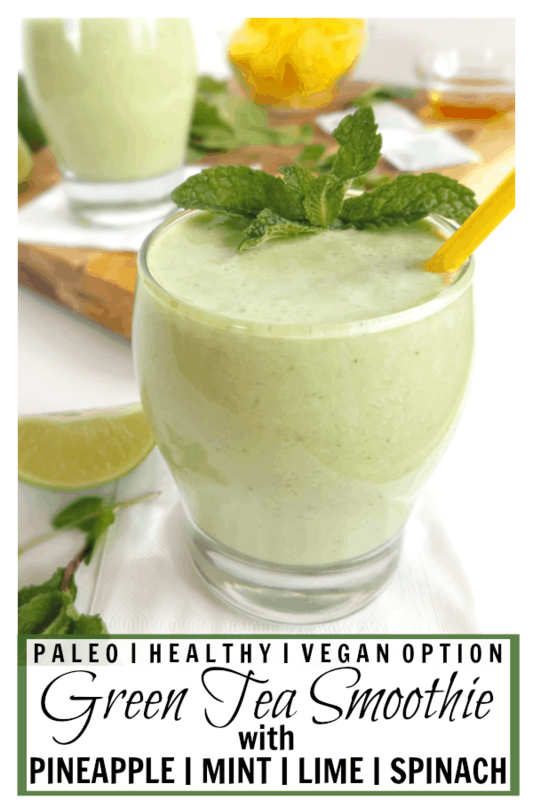 Yup, this smoothie is dairy-free, nut-free, Paleo, Primal and can easily be made vegan! Green tea contains EGCG, the most biologically active and extensively studied antioxidant in tea. Research has recently found that EGCG may be helpful for relieving allergy symptoms by blocking the production of compounds that cause allergic reactions. Well-Being Secrets has a comprehensive article on the many benefits of green tea that you can find here. Science Daily also has an article that you can read here. Pineapple contains the enzyme bromelain which is thought to help reduce both the inflammation and mucous associated with allergies (click here, here and here for more info). 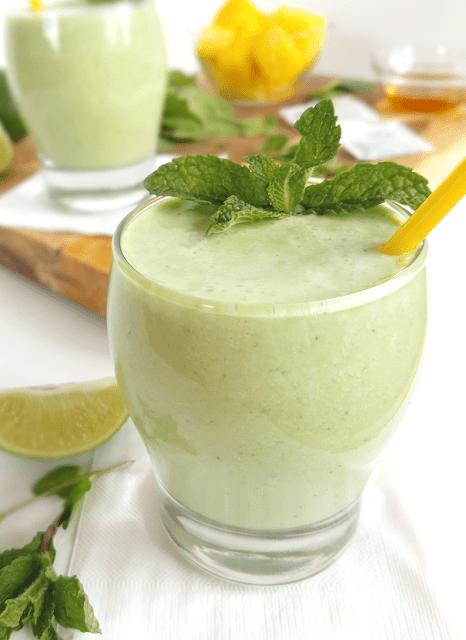 Spinach is nutritious for a long list of reasons, but I included it in this smoothie because it contains quercetin, an antioxidant that may help to moderate histamine production (click here for more info). Interestingly, apples are one of the richest natural sources of quercetin, but according to the American Academy of Allergy, Asthma and Immunology, raw apples contain proteins similar to ragweed and can actually irritate allergies in some people. For the complete list of foods from the AAAI that can aggravate allergies, click here. Lime Juice also contains quercetin. As mentioned above, quercetin is an antioxidant that helps to calm histamine production. Citrus fruits, like limes, are great sources. Local Honey that is unfiltered and unpasteurized may help with allergy symptoms by providing tiny amounts of local allergens that help the body build up immunity (click here, here and here for more info). Mint contains rosmarinic acids which helps to fight allergy symptoms by normalizing the number and activity of cells that produce histamines and inflammation (click here and here for more info). Coconut milk is included for a few reasons. First and foremost, some of the ingredients in this smoothie contain nutrients and antioxidants that are far better absorbed with fat, such as the oil contained in coconut milk. But the oil in coconut milk also has beneficial properties of its own. Research has shown that coconut oil has anti-inflammatory properties and that a specific fatty acid called lauric acid supports the immune system in its fight against viruses. So even if allergies do drag you down, the lauric acid in this smoothie will help your immune system stay strong so you don’t get sick on top of it. If you are getting the feeling that this Green Tea Smoothie rocks, you are right! Not only is it refreshing and delicious, it’s nutritious, friendly to special diets and may help soothe allergy symptoms. As an added bonus, this Green Tea Smoothie just happens to be a fun color of green for St. Patty’s Day! To make this Green Tea Smoothie with Pineapple and Spinach nice and smooth, I don’t use a Vitamix. It’s just not in my blood to spend $400 on a blender! Instead, I use my trusty Ninja Master Prep that I’ve had for several years. I grinds up ice and spinach like a champ and it’s only $30! $370 saved. That’s my kind of gadget! This Matcha Green Tea Smoothie with Pineapple and Spinach is refreshing and delicious, but it's also super nutritious, dairy-free, nut-free, Paleo and easily made vegan! 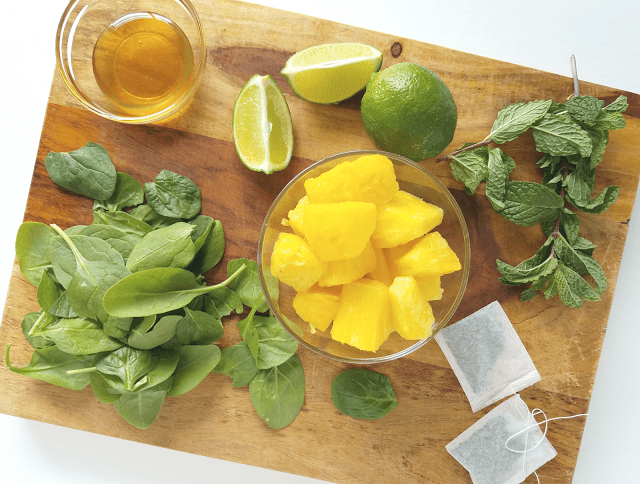 Place all ingredients in your blender or Ninja Master Prep, with the spinach and mint leaves at the bottom and pineapple and ice on top. Blend 1-2 minutes, or until smooth. This looks delicious and I love the vibrant green colour! Would coconut water work as well in this recipe? Hope that answers your question, and I hope you enjoy the smoothie!